Some say lentils are the world’s healthiest food! They are an excellent source of folate, as well as a very good source of dietary fiber, copper, phosphorus and manganese. Additionally they are a good source of iron, protein, vitamin B1, pantothenic acid, zinc, potassium and vitamin B6. In short, lentils should be considered a super food! And they are cheap, even if you buy organic. I buy my lentils and beans in bulk, dry, as that’s the cheapest, and without any unnecessary packaging. If you have trouble digesting lentils, then try adding some savory while cooking your lentils or beans. This salad is excellent for a hot summer day or as a side dish to your vegan BBQ. Put the lentils in a cooking pot with plenty of cold water, bring to boil and let simmer for about 20 minutes, or until perfectly cooked (taste). Add some savory if you have trouble digesting lentils. Don’t add salt while cooking (this prolongs the cooking time). Wash (scrub) the veggies. Cut in small same size bits (except the carrots) & grate the carrots. Make the salad dressing: mix the tablespoons olive oil with mustard, lemon juice, some black pepper and Cayenne pepper (optional: add the pomegranate molasses). When cooked: directly rinse the lentils with cold water in a sieve. Put the lentils in a large bowl, add the veggies and the salad dressing. Mix well. Optional: add capers and roasted sunflower and/ or pumpkin seeds. This salad is delicious warm, lukewarm & cold. Enjoy! TIP: you can add some lettuce, purslane or rocket as well as fresh herbs (parsley, coriander, basil, …). Categories: Vegan recipe, Yogi food | Tags: lentils, recipe, vegan | Permalink. Some say lentils are the world’s healthiest food! They are an excellent source of folate, as well as a very good source of dietary fiber, copper, phosphorus and manganese. Additionally they are a good source of iron, protein, vitamin B1, pantothenic acid, zinc, potassium and vitamin B6. In short, lentils should be considered a super food! And they are cheap, even if you buy organic. I buy my lentils and beans in bulk, dry, as that’s the cheapest, and without any unnecessary packaging. Some people have trouble digesting lentils, then try adding some savory while cooking your lentils or beans. 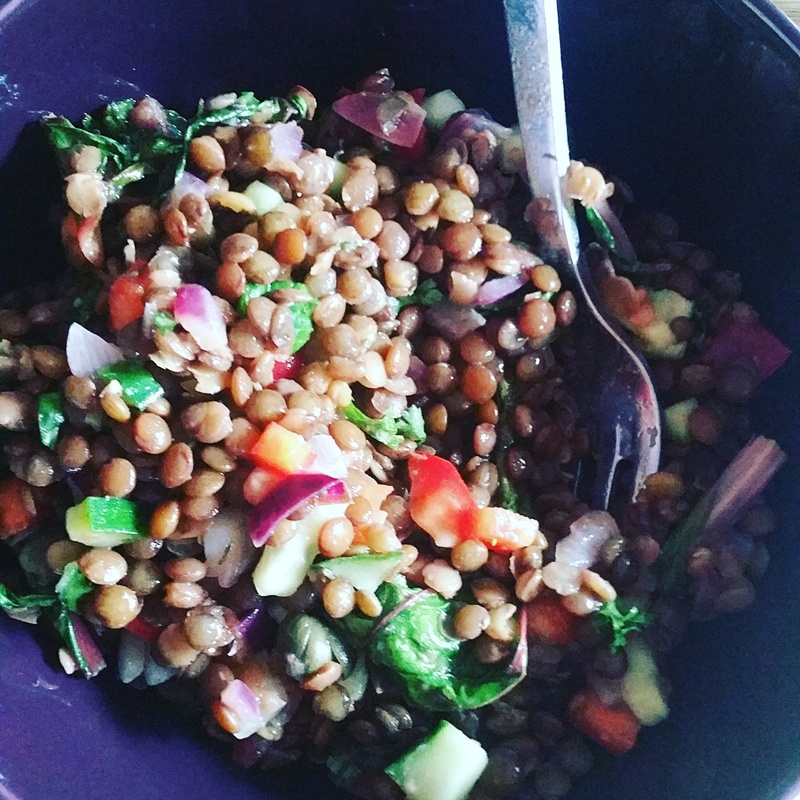 If you are looking for a quick and filling meal, make a lentil with roasted veggies combo. Wash (scrub) the veggies, peel if necessary. Cut in same size chunks (not too small, not too big). Prepare a large bowl with some olive oil, salt & pepper and mix all the veggies in there until they’re evenly coated. Spread the veggies on greaseproof paper covering a large oven grid and roast for about 30 minutes (turn them after about 15 minutes), or until nicely roasted but with still crispy bite. Make the dressing: mix some tablespoons olive oil with mustard, lemon juice, some black pepper and Cayenne pepper (optional: add the pomegranate molasses). Rinse the lentils with cold water in a sieve when perfectly cooked. Put in a large bowl, add the roasted veggies and then the dressing. Mix well. This is an ideal meal when you are pressed for time and still want to eat a healthy and filling meal: right after your yoga practice or at lunch for example. The soup can be eaten as a full meal on its own or served with a cooked grain (quinoa, millet, …), potatoes from the oven, some bread or chapatis, … You can also choose to eat it with seasoned and stir fried or oven-baked tofu or tempeh. Use your imagination to adapt it to your favorite tastes with some chili, some other herbs or spices of your liking. Wash the vegetables & cut in ~2cm cubes. Peel the ginger root & grate it or cut it in small bits. Thoroughly rinse the lentils until the water runs clear. Heat some (preferably coconut) oil in a frying pan (wok). Add the mustard & coriander seeds; wait until they ‘pop’. Add the ginger root; stir for 2 minutes. Add the garam masala & turmeric powder; stir for another minute. Add the pumpkin and other seasonal vegetables of your liking (I added some celeriac); stir fry for a couple of minutes. Add the lentils; stir fry for another 2 minutes. Add the filtered water & the bay leaves; leave it to boil. When it boils, lower the heat & let it simmer for approximately 25 minutes or until the vegetables and the lentils are tender. You may have to add some water depending whether you want a soup or more thick sauce type of dish. Add salt ONLY at the end (as it’ll prolong cooking time) & season with pepper. Take out the bay leaves before serving & serve with the fresh parsley on top. Serve with quinoa, millet or some other whole grain you like. Categories: Yogi food | Tags: ginger, lentils, pumpkin, quinoa, soup, vegan | Permalink. As a first yogi recipe, I’d like to share the most common Indian dish: rice and dahl. 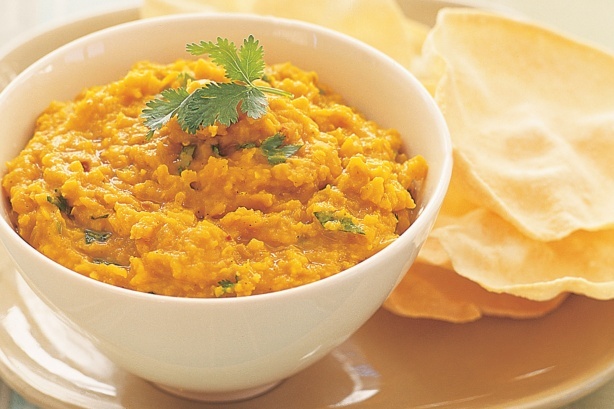 A typical dahl is composed of some type of lentils, water, mustard seeds, lots of spices and often carrots, ginger and coriander. It’s a very easy dish to prepare and very filling as well. I never cook dahl just for one meal or person, mostly I cook enough for several meals or people. Wash the lentils thoroughly, until the water runs clear. Peel & grate the ginger. Cut the garlic/ onions if using. Peel & slide the carrots.Heat the oil in a wok. Add the mustard seeds and wait until they ‘pop’. Add the freshly grated ginger (and garlic/ onion if using), stir until golden. Add the turmeric and cumin powder. Stir everything until the spices become very fragrant. Add the carrots, stir fry to coat the carrots with the spices for 2 minutes. Add the washed lentils, mix everything well. Add 3 cups of filtered water, the bay leave and bring to boil. When the water boils, lower the heat, let the mixture simmer for about 15 minutes, make sure to keep on adding water if the mixture becomes dry. The dahl needs to ‘swim’. Taste the mixture when the lentils become soft, then add salt & pepper to taste. You can add half of the dahl mixture in a blender, blend it for a short while & add it back to the pan to have a more firm dahl. Serve with quinoa or rice and add some freshly squeezed lemon or lime juice and coriander leaves. This is a very hearty meal for cold winter nights but I admit I can eat it any day of the year. Try to experiment with different types of lentils, mung beans, etc. It’s also nice to add some coconut milk to your dahl for a softer flavour. You can find all the ingredients in your local Indian or oriental shop. I prefer to buy mostly organic, most of the ingredients can also be found in your organic foodstore (except for garam masala I haven’t yet found an organic version in Brussels). 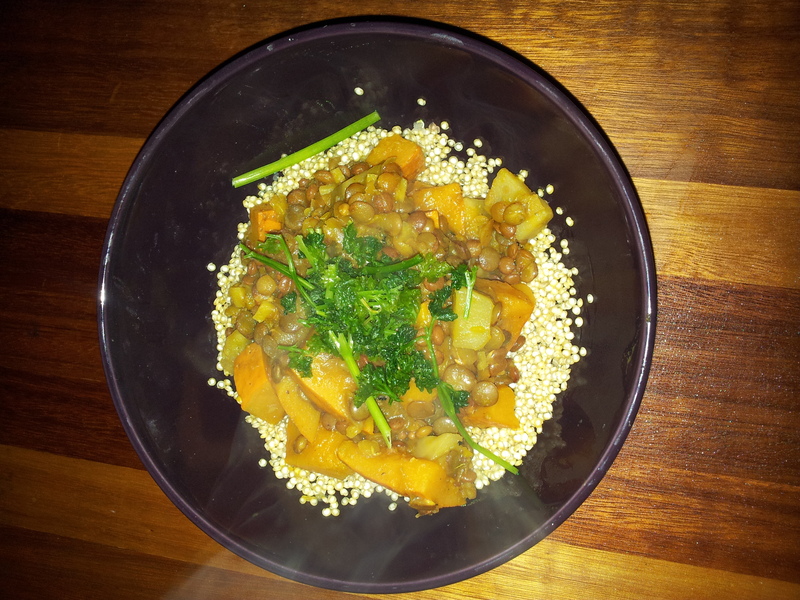 Categories: Yogi food | Tags: dahl, dinner, food, ginger, Indian, lentils, main, recipe, vegan, vegetarian | Permalink.